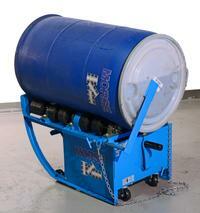 Idler Attachment (Option MO-1-5P) allows rolling a 1 to 5 gallon pail. Rotator makes settled materials homogeneous before removal from drum and also eliminates spills, transfer time and clean up. Four 4" diameter neoprene drive wheels and four 4" diameter neoprene idler wheels provide positive support. 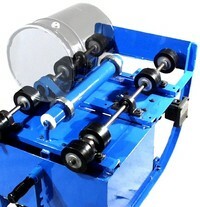 Frame rolls on four 3" non-sparking copolymer wheels and has a retractable tipping lever. 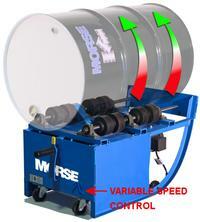 Factory set speed reduction assembly provides fixed speed 10, 20 or 30 rpm rotation. Liquid load capacity 500 lbs. Steel drums 6" - 28" diameter, up to 40" tall. Unit is 34.5" x 21" x 19.25". Drum rim is 17" off floor. Install Morse Rotators in accordance with OSHA requirements for enclosure and interlock, etc. For OSHA compliance, see OSHA subpart O.1910.212 "General Requirements for all Machines." Power connections and motor controls must comply with applicable codes. 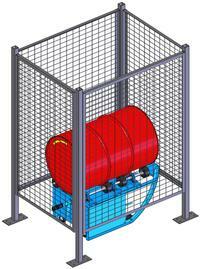 Place your drum roller into the cage and close it to begin rolling. When the cage is opened, the drum roller is automatically shut off. Model M-201B - The belted drum rollers have a pair of belts between the rollers to turn drum (instead of 2 rows of wheels). 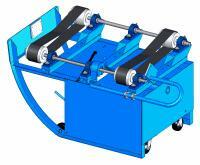 Belts allow it to roll a fiber drum weighing up to 300 Lb. without damaging the fiber sidewall. Model MO-POLY-201 - Plastic drums are soft-sided and lack the ridged ribs and rims of a steel drum. They require special features to position them on the drum roller, and to prevent them from traveling lengthways during rotation. Chain to latch around the top of the drum while tipping from upright to horizontal rolling position on the drum rotator. The chain should then be released during drum rolling. Stainless Steel Verison is available - Please call ZORIN (888) 378-6525 for Pricing. Thanks.